Classic Italian panna cotta is an easy make-ahead dessert that will impress everyone at your table. 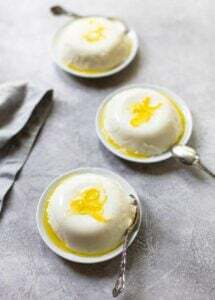 This olive oil-infused panna cotta is silky-smooth and light, made with cream, tangy buttermilk and scented with lemon and vanilla bean. Put the gelatin in a small dish and pour the water over. Stir to dissolve. Whisk the olive oil into the buttermilk. Combine the heavy cream, sugar, vanilla bean and scraped seeds, lemon zest and salt in a saucepan. Place over medium-high heat and whisk to dissolve sugar. Heat just until bubbles start to form on the edge of the pan. Remove the pan from the heat and stir in the gelatin until it dissolves. Add the buttermilk mixture and stir to blend. Pour through a mesh strainer into a container with a pour spout, such as a liquid measuring cup. Pour into 6 custard cups or ramekins with 1/2-cup capacity. Cover and refrigerate until set, at least 4 hours. To serve, dip the bottom of each cup into warm water and loosen the sides with the edge of a dull knife or small offset spatula. Invert over a serving plate, wiggling the cup until the panna cotta releases. Sprinkle the tops of the panna cottas with lemon zest and drizzle with olive oil.